It was January 2017 at the strategic planning retreat that Legacy of Hope talked more in-depth about the dream of opening pregnant teenager services as the natural progression of care we provide. We were already caring for abandoned babies in families and children in crisis in our Casa Segura (previously Centro de Paso), but there were always special cases that needed specific care outside of what we were already providing. In order to care for them with excellence, we needed to create an additional space separate from the crisis care. One of these areas of special care is pregnant teenagers and young mothers. When Hope first came to us, she was 12 years old and pregnant. She had been sexually abused by a man in her community, and DINAF removed her to investigate the situation. In her time at Casa Segura, she made so much progress toward healing from her trauma and embracing the child growing inside her, but her time with us was cut short when child services came to pick her up. She was sent back to her mother, the same community that sets the scene in her nightmares, and consequently, the man that caused them. While she was with her mom, she gave birth to her sweet babe. And after, she was abused once more by the same man. With her safety obviously not being upheld, DINAF once more whisked her out of that situation, and back to our door. This time, with a precious baby in her arms. Having to start from the beginning, the staff covered her in love and warmth and began her process of healing anew. She had champions that worked with her through her anxiety, nightmares, eating disorders and learning how to be a mom. In this time, Hope was moved out of Casa Segura, into a more tranquil environment with a care giver that focused on demonstrating how to be a mom. Her caregiver also tutored her in school lessons and gave her opportunities to be a kid so she did not miss out on those key areas of development. Such a change occurred in Hope, and it was obvious to everyone. You could often see her in the play yard pushing her chunky baby boy in the baby swing, or sitting on the front steps of her home laughing as he bounced up and down in her arms. She was joyful. Our hope for her future became concrete when we got word that she would be reunified with her uncle and aunt in San Pedro Sula. This is the family she had desired to be with above all else. Her uncle is a pastor, and he had also taken in Hope’s other brothers and sisters as his own. This time when she left our care, she was not crying tears of fear, but tears of gratefulness and hope for the future. In their time with us they received many layers of care. All physical needs were met such as food, clothes, a bed, medical care, etc, but our foundation is committed to complete restoration, not just meeting immediate external needs. The focus is on a holistic 5-point child development plan that also includes the areas of spiritual, educational, emotional and social health for each child that comes into our care. However, in the case of teen moms, we must dive even deeper. Providing holistic care with a 5-point child development plan is merely the jumping off point for these young mothers. If we seek to change the trajectory of these young girls’ lives, we must create a program that sets them on a path towards healing. The staff at Legacy of Hope has walked faithfully beside each girl as they worked through the program for teen mothers. Step 1: Help them understand why they are in care. You may be surprised to learn that many children look at their abuse as normal. This is all they have known in their life, so it takes a long time (and a loving caregiver) to help them change their belief system and understand why the assault was wrong. Step 2: Teach them to love themselves. Many times children blame themselves for their assault. They have been so torn down by verbal and physical abuse that their self worth is non existent. If you can’t love yourself, you can’t adequately love your baby the way it needs. Step 3: Work through the curriculum. The curriculum is broken down into 14 sections. This 14 week plan focuses on self-evaluation and therapy in tangible ways, and helps each girl make a plan for her life. In the cases of conception resulting from an assault, the most critical part of healing is necessary before the child is even in their arms. It is vital that the mother is able to separate the life of her child from the assault. If the mother does not undergo any therapy to help with this, she often times ends up abandoning her baby. One such baby was placed in one of our foster families because when her mother looked at her face, all she saw was him. She could not give her child the care she needed because she was still entrapped by the horror she endured. Step 4: Create activities to get them excited for their baby. Some activities include writing psalms, decorating their room, picking clothes, and picking a name for their baby. Step 5: Allow time for them to still be a child/teen. There are still many key developmental milestones to be met at these young ages. If a child isn’t given the chance to still be a child, they will lag behind developmentally even though they have had to “grow up” way to quickly. Giving them time to do fun activities while their child is being cared for is vital. Step 6: Build in additional learning opportunities. There are many learning gaps we seek to bridge though education in breastfeeding, swaddling, schedules, expectations, safety, and more. But it’s also important that we put an emphasis on continued schooling. When children have access to quality education, they are significantly more likely to become self-sustaining individuals. With this we also try to integrate them into the house responsibilities in different ways such as cooking dinner, washing clothes, and cleaning. 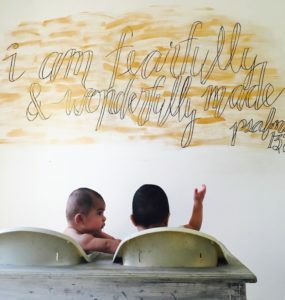 Each child in our care is fearfully and wonderfully made by our Creator God, and we are called to help them understand that about themselves. In the case of teen moms it’s also important to help them understand that truth about their own baby. There is a purpose for their life and the life of their child that the trauma they experienced cannot touch or tamper with. Like Hope, we pray that each young girl who comes through our program will be set on a path of healing and complete restoration. Please join with us in covering this new area of ministry in prayer: prayer for the girls past and future taking part in the program, the children they bring into this world, the staff caring for them, and the social worker we are currently searching for to head up this program. For you created my inmost being! You knit me together in my mother’s womb! I praise you because I am fearfully and wonderfully made! Your works are wonderful, I know that full well!